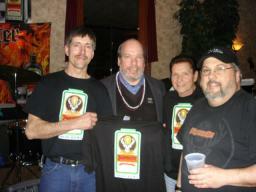 Frank and Gabe, along with special guest drummer, George Staley, present an FPB/Jagermeister t-shirt to Kevin at the Dyngus Day Bash in Amherst, NY on April 9, 2007. Kevin booked FPB for the festive gig. 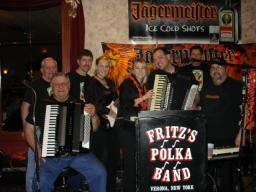 FPB with special guest drummer, George Staley, take a pause in their final set to get a picture with Jen (with Frank's guitar) and Laura (playing Fritz's accordion), on April 9, 2007. 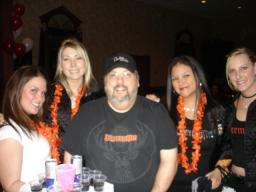 George (guest drummer) and Fritz pose here with a couple of lovely Jagerettes on April 9th at the Dyngus Day Bash. 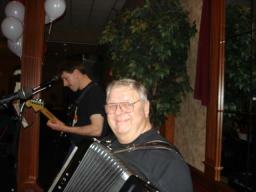 Tom is so happy to be at the Dyngus Day Bash in Amherst, NY on April 9th, don't ya think? A few of the guys in FPB, along with special guest drummer, George Staley, pose here with the lovely Jagerettes, Jen and Laura, near the Jager Tap Machine at Classics V on April 9, 2007. 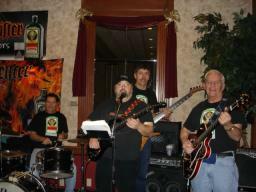 Gabe, Frank, and Tom, along with special guest drummer, George Staley, are shown here during FPB's gig on April 9th. 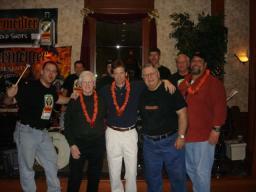 The guys in FPB, along with special guest drummer, George Staley, make some new friends in Amherst, NY on April 9, 2007. 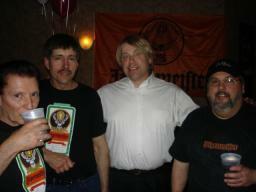 Frank and Gabe are shown here with special guest drummer, George Staley (L) and John (one of the Jagermeister managers), during a break in FPB's performance at Classics V on April 9th. 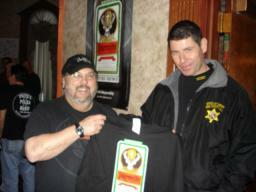 Gabe presents one of Erie County's finest with an FPB/Jagermeister t-shirt at the Dyngus Day Bash on April 9, 2007 in Amherst, NY. Fritz is so happy to have FPB sponsored by Jagermeister. This photo of Fritz with the lovely Jagerettes, taken April 9th, shows just one of the multiple reasons why. Gabe is pictured here with the lovely Jagerettes at the Dyngus Day Bash at Classics V on April 9th. Has Gabe ever smiled this much at a gig before? Hmmm... While Frank concentrates on his Fender, Fred is all smiles while playing his Excelsior in Amherst, NY on April 9, 2007.